DCCE and Vibrocomp ME to develop standardized emission inventory methodology for the UAE. Vibrocomp ME is a part of team of experts selected by the Ministry of Climate Change and Environment and the Global Green Growth Institute, to develop the first standardized methodology for setting up the first Emission Inventory for all seven Emirates. Last week at the stakeholder workshop, I presented the most common approaches and international best practices, as well as the use and benefits of an accurate emission inventory to the entities from the seven Emirates. We strongly believe in the strategical importance of this project and the significant benefits it will bring to the UAE. Qatar Deserves the Best, also in Environmental Consultancy. We are all very pleased to inform you that Vibrocomp has just opened its newest branch in Doha, Qatar. It has been an issue of consideration in the past few months, that an important state like Qatar warrants a completely different branch instead of just one solitary department in the Middle East Office. We have decided that the office will be a success and a well-earned success at that, as we expect all our new employee as well as those we will transfer to work hard, use their local experience and latest state-of-the-art technical knowledge and bring up the office to the levels of excellence in the State of Qatar. VIBROCOMP now further underlines its significant role in Air Quality, Noise and Vibration consultancy in the GCC region. VIBROCOMP received this prestigious award in recognition for the excellent quality, innovative character and for being always on time with the services carried out for Dubai Municipality Environmental Planning and Studies Section under the lead of Eng. Hind Mahmood Ahmed. The Distinguished Supplier Award acknowledges the strong commitment to quality and excellence, and strengthens further the strategic partnership between Dubai Municipality and VIBROCOMP ME. 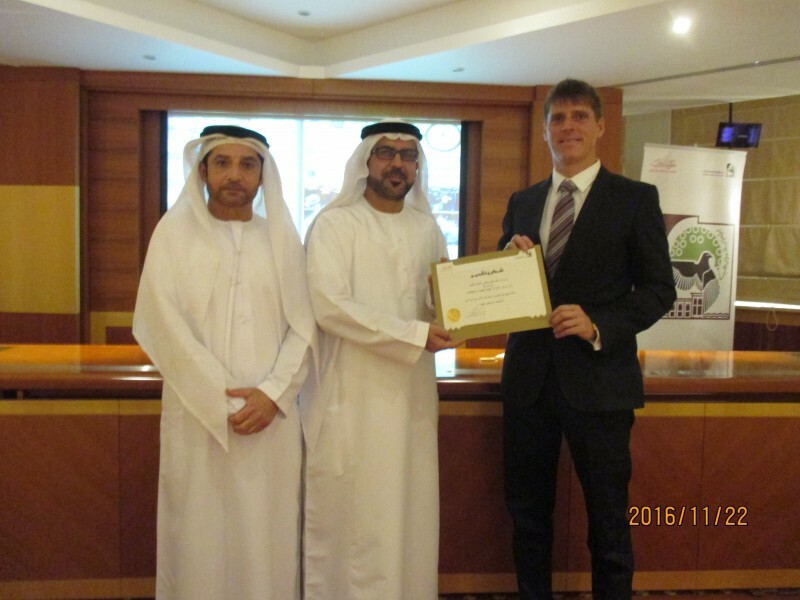 Dr. Pal Bite, CEO, received the award in Dubai, from the Director of Contracts and Purchasing Department at Dubai Municipality, Eng. Ibrahim Yaqoob. The Arabian Gulf is full of marine species and sound. Most of the sounds come from the natural environment: such as waves or winds. Marine species also contribute to the ambient noise levels, they produce sounds that can be detected underwater. Sound is the only form of communication many marine animals use to survival activities (orientation, mating,..). Man-generated noises affect these behaviors and have an impact upon organisms in other ways as well. Currently, there are no rules and regulations that specify underwater noise limits for underwater activities such as construction works. Today, our CEO Dr. Pal Bite held a successful speech at the Arabian Coast 2016 conference, the 3rd International conference on coastal zone engineering and management in the Middle East - Organized by Dubai Municipality. The conference is Under the Patronage of HIS HIGHNESS SHEIKH HAMDAN BIN RASHID AL MAKTOUM Deputy Ruler of Dubai, UAE Minister of Finance, Chairman of Dubai Municipality. During the presentation, he draw the attention of the importance and the possibility of preserving of our marine environment. He presented theeffects of underwater noise on the marine species of the Arabian region, as well as prediction, modelling & monitoring techniques of underwater noise and provided a roadmap on how to mitigate harmful effects. Vibrocomp has significant experience in prediction, modelling and monitoring of underwater noise during major construction activities such as piling or dredging. We consider proper monitoring as one of the most important tools to support sustainable underwater construction activities. Usually our work starts already in the planning phase with identification of noise sources and the critical periods of work activity respective to the sensitive marine species of the construction area. Based on preliminary model calculations the most critical phases of the construction activity as well as the close impact are can be predicted. Accurate predictions form the basis to avoid the very expensive permanent underwater noise monitoring, as activity can be reduced to the most critical phases. Finally, I gave guidance to stakeholder on best practice applications, how Vibrocomp applies the described tools give support to save the marine environment. also in Environmental Consultancy. Vibrocomp Middle East opened to Qatar with a significant knowledge-transfer and awareness raising campaign at The Public Works Authorithy 'Ashgal' in Doha.